Sathyam Sivam Sundaram Part III: 5. "Sign and Signature"
When Baba called, "Roll up your bed and follow Me", very few realized that the call was for Nagarasankirtan! At the World Conference, Baba advised His devotees to wake up at 4 or 4.30 in the morning (the Brahmamuhurta as it is called), and move along the streets singing the Glory of God, awakening people into the awareness of the Divine. Sankirtan of this type was a common feature of village life in the past, but due to apathy and ridicule, the habit is fast disappearing. After Baba's command, people who had never seen the sunrise, since they arose from their beds only when it was high up in the heavens, have started moving out into the cool, refreshing air to join their brothers and sisters in rendering the new day a happy event to themselves and to others. When Baba said, "Follow Me", it was clear that He meant He, in any one of the Infinite Forms that God assumes, and with any one of the Infinite Names that God can be remembered. As a matter of fact, Baba has announced that hymns on a variety of these Forms and Names have to be sung, and that no portrait of either Himself or of any other Forms of Divinity be carried when the Bhajan party moves on. "Follow God", that is His call. The intricate mysteries of metaphysics are beyond the ken of the common man; even those who can delve into them, do it for the pleasure of disputation or dialectic gymnastics; they do not intend to practice even an iota of the principles of life underlying them. The abstruse labyrinth of rituals, with its armoury of do's and don'ts, create only apprehension in him. Mere Jnana, (knowledge) can make you a good logician or a debater capable of indulging in hair-splitting sophistry. But if it is lived through, or in other words, implemented, then you become a Jnani (a wise man). Sadhana or practice helps you to achieve the goal of life. Baba has restored faith in the Name and the efficacy of the Name "Call on Me in your distress; it is your right to invoke My Grace." Dr. D.J. Gadhia, of the H.H. Agha Khan Dispensary, Arusha, Tanzania, writes: "In May 1971, Mr. Jamnadas M. Patel became seriously ill. When this poor soul was called to attend on him, there was no breathing; the heart-sounds had completely stopped. The pulse could not be felt. The heart was massaged with sacred Vibhuti, with sincere prayers. He recovered miraculously. 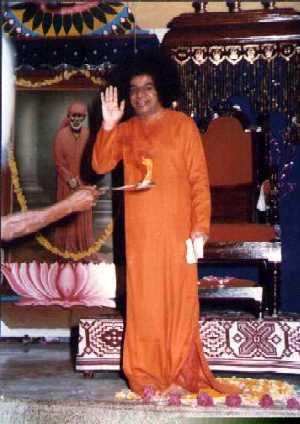 When Mr. Jamnadas visited Puttaparthi, Baba told him, "I gave you new life, as your doctor called Me at the right time." Devotees of Baba know the unfailing power of the Name to bring forth the Grace of Baba. They need no elaborate argument to convince them that Sankirtan is the shortest and the sweetest means of winning His Grace. But, there were some who had their fears! Will people get up so early? What about the rich, the officers who wield authority over the area? Will the neighbours permit singing in the early dawn? Will the police keep quiet? What about dogs, will they not bark us out or even inflict a bite? Many who felt they should not be seen singing in the streets, but who wanted to observe Baba's command, started at 3 a.m. when the streets were empty and all were sleeping soundly, and came home quickly before they could be discovered! But soon the atmosphere changed. A wave of wholehearted enthusiasm swept over the land from one end to another. Neighbours welcomed the melodious tonic! The police themselves joined, to imbibe delight! The dogs were no problem at all. From one day in the week the Kirtan was increased in frequency to two or three, and in some places every day in the week. The distances covered increased, the number in each group multiplied. Soon each section of the town or city had its own Nagarasankirtan party. They usually met in a temple and proceeding from there, ended up in another temple. In Sathyavada, it was found that some mysterious person knocked at the doors of sleeping members and asked them to wake up and join the party. In Chembur, Bombay, they noted that on no day, even during the most furious monsoon days, was the Nagarasankirtan party disturbed or bothered by even a drizzle. At Gauhati, Assam, Sri Dutt Gupta moved on along the usual route at the usual time, with the name of God on his lips and the group behind him. A cyclonic wind was raging and roaring, bringing "cats and dogs" with it; on the way, the chaprasis and watchmen of the State Treasury warned them to take shelter from the oncoming calamity, but they sang and stepped as slowly as usual, to the place where they generally end the Bhajan and perform Arati before they disperse. The rain did not fall upon the road, the drizzle did not wet their clothes, the wind did not disturb their hair! People unable to walk without a stick have, after attending a few of these matinal Bhajans, thrown off the stick and walked majestically along. I know of an invalid in Channarayapatna, Mysore, who earned Grace in this manner. Baba has said that the Nagarasankirtana is Bhagavatha in practice. When the senses are still dormant after the night's sleep, before they get too loudly involved in the pursuits of the busy day, you should move along the quiet streets in the cool, thrilling pre-dawn silence, bringing God into every ear, radiating the fragrance of the Divine Name through every open door and window. This is self-help as well as social service of the highest order. It is a tonic to the body and a shake-up to the mind. Every song cuts the knot of laziness that is infecting someone. You remind your neighbours to offer thanks to God for the gift of another day; it is a mission of love. It is a purificatory Yajna, for it disinfects the air fouled by slogans of anger and cries of pain and pride. It helps to remove inner and outer pollution. Several such groups operating in different parts of Hyderabad converged towards the Lotus Feet of Bhagavan. The sight and sound of Bhajan was a feast for the eye and ear; Baba blessed the participants and granted them further impetus to continue their Sadhana. An Akhand Bhajan (singing the Names of God continuously for 12 or 24 hours) was arranged on 25th July by the Bhajan Mandalis of Bangalore at the famous Lal Baug gardens in the glass house. The inscription at its entrance "The garden of flowers is the temple of God" appeared so apt during the singing of Bhajan in the Divine Presence of Baba. Baba lit the lamp to mark the inauguration of the Bhajan, and when it came to an end, He sprinkled on the heads of the thousands attending, the water sanctified by the holy hymns. In the evening when Baba arrived to give His discourse it was raining. Baba does not like anyone suffering in sun or rain. His heart is moved with irrepressible compassion. He moved amongst the people, made them sit inside the building, lifted an iron chair for Himself from behind the table on the dais and placed it in a position from where all could have Darsan, and thereafter commenced His Discourse. Krishna Jayanti, 1968 was celebrated at Prasanthi Nilayam for 3 days. Many Samithis call it Sai Krishna Jayanti; they have converted it into a children's festival, when children are given new clothes, trained to enact small plays and sing Bhajans. At Prasanthi Nilayam Bhagavan gave three discourses on Krishna and the significance of the Leelas. Dwelling on the value and validity of the Name, He said that the root of the Name Krishna implies power to attract, to enchant. Krishna is the personification of the Divine principle that is born in the umbilical region of the body (Mathura), which is conveyed to the mouth (Gokulam), and there fostered by the tongue (Yasoda), who alone knows the sweetness. "Foster Krishna on your tongue", He advised. "Just as the poison from the hoods of the serpent Kalinga [See Bhagavatha Vahini, Chapter 40] was ejected when Krishna danced upon them, bad thoughts from your system will evaporate if you recite the name of Krishna," He said. His interpretation of Krishna-Avatar as a consummation of Yogamarga reveals that this Avatar has come to coordinate and collate the apparently differing paths to God. The three systems of philosophy - the dualist promulgated by Madhawacharya, the qualified non-dualist promulgated by Ramanujacharya and the non-dualist promulgated by Shankaracharya - are all emphasised by Him as adjusted to the needs and capabilities of seekers and listeners. An Avatar appears from age to age whenever Dharma is on the decline so as to reaffirm faith in right conduct. [See The Gita - Fourth Chapter, verses 7&8] Chitha-shudhi leads to Jnana-Sidhi, that is, goodness leads to Godliness. The Avatar will guard and guide and fill with Divine bliss, all those who have Sathvic pure virtues. This declaration is addressed to a dualist. From the "qualified non-dualist" point of view, Jiva and Deva are the two rails, along which the engine, Manas, is dragging the coaches of Vishaya Vasana. Each coach contains items of luggage viz., Buddhi, senses etc. Atma is the driver of the engine; if the coupling with the engine is not well tightened, the coaches will be left loose on the line. Bhakthi and Sraddha are the coupling, they should be tightly fixed. It is 'absolute non-dualist' philosophy when the seen (Drsya) world is superimposed on the undivided, indivisible Brahman. It can only be as real as the turrets and bastions of a city among the clouds. Can anyone build castles in the air and live therein? The turrets and bastions are fantasies and creations of your own fancy, ephemeral and meaningless. So too, in this Akash-like Parabrahma, this Jagat is superimposed; it is baseless and false. Everything is only the Chaithanya of the non-dual, unequalled, bliss-pervaded Parabrahma. According to Bhagavan, what others think you are is the dualist view; what you think you are is the qualified non-dualist view; what you really are is the non-dualist Truth! Dasara 1968! It was remarkable for more reasons than one. Baba made it clear that He is the Sanathana Sarathi as well as Parthasarathi ('the charioteer of the earth'), while addressing the volunteers. "I too have certain vows to fulfill, they have been mentioned in the Bhagavad Gita. I have to uphold the supremacy of Dharma; I have to bear the Yogakshema (acquisition and maintenance of welfare) of those who are immersed in thoughts of Me alone. The best way to please Me is to see Me in all beings and serve them, just as you yearn to serve Me." "I have none to compel Me to work, nor do I profit by work. Still, I work without intermission, in order to guide and teach and set things that are awry. If I remain inactive, [BG: Ch. 3 : 22-28] how can the wheels of the world revolve? I have no manager, secretary, aide or assistant. I attend even to the minutest detail, here and everywhere. I do everything Myself. I need no other food than the Ananda of beings. I am Anandaswarupa, My nature is Ananda; Ananda is My sign and signature." "Shall I tell you exactly when I feel restful, relieved and content? When I know that you are having Ananda, through the cultivation of detachment and the spiritual discipline of Seva. I am ever engaged in some activity or other for your benefit. There is none to question Me if I do not act; there is nothing I would lose, or could gain. Although I have no urge to be active, yet you see Me ever active! The reason is, I must be doing something all the time in order to inspire and instruct you or to set an example for you. I am engaged in activity, so that you may learn to transmute every minute into a golden chance to elevate yourselves into Godhood." "When the Gita directs you to give up all Dharma, it does not ask you to give up all Karma! For you cannot escape that obligation. But, when you do Karma for God, through God, and knowing that He is the doer, not you, every Karma becomes Dharma, leading to Grace. No Karma can then be tainted by sin or sacrilege. The Gita assurance is therefore not an invitation to licentiousness, sloth or inactivity, it is a call for the surrender of the ego and dedication to God of all that it 'is' and 'does'." "You have to pour into the flames that rise up to destroy, (for they are the flames of revelation, purification, discrimination) the limited vision, that sees nature as different from the divine. The divine created all this through the divine and with the divine substance." "Sarvam Brahma Mayam": All this is Brahman. The offering is Brahman, the fire is Brahman, the offerer is Brahman, the goal is Brahman. Transmute every trifle into God; everything in the objective world is the divine, appearing to the limited, the myopic, the ignorant vision as different. In a silver idol, the crown is silver, the clothes are silver, the pedestal is silver, the flesh is silver, the face is silver, the eye is silver. Know the silver and declare: "Sarvam Brahma Mayam"
In another discourse, Baba integrated the three paths of Karma, Bhakthi and Jnana, in a very illuminating manner, so that the world could follow them with proper understanding. "When someone asks your name, you do not give your real name; you fob him off with the name by which your body is identified as separate from other bodies in this life. You do not give the name that has been with you life after life, that has survived many deaths and births, namely, Atma! That name is ignored by you, since it is overlaid by three veils - Mala, Vikshepa and Avarana; Mala is the dirt of vice, wickedness and looseness. This is removed by Karmamarga, the observance of selfless activity dedicated to high purpose, and with no tinge of pride or pomp or sense of ownership so far as the fruits of that activity are concerned. The second veil is Vikshepa - ignorance which hides the truth, befogs the intellect, confounds reason, and clothes falsehood with the tinsel that attracts. This is removed by Bhakthimarga, steadily worshipping the source and sustenance of all, Him, the True, the Good, the Beautiful, the Embodiment of Love, Peace and Joy, in all, as all, for all, through all." "The third veil is Avarana, the superimposition on the eternal of the temporary, on the rope of the snake, on the noonday desert of the gleaming lake, on the mother-of-pearl of silver, on the Sarvam-Brahma Mayam (Brahman that is the real Reality of the Universe) of the multiform, multicolored, distracting, changing world. This veil is removed by Jnanamarga, which reveals the Atma as all-pervading, all-inclusive, all-sustaining. When the illumination of Jnana is gained, the reality is experienced and man is free. He merges with the truth from which he broke off aeons ago, on a long and arduous adventure into the dark night of individuality." Dasara is a Festival of Victory, of Power (Sakthi), adored and celebrated in three forms, for three days each - Mahakali (the facet of Power as anger, vengeance, adventure, audacity, the Thamasic nature), Mahalakshmi (the facet of Power as wealth, authority, imperium, prosperity, the Rajasic nature), and Mahasaraswathi (Power as self-control, vision, value, validity, knowledge, keenness, discipline, justice, aspiration, adoration, the Sathwic nature). Dasara at Prasanthi Nilayam is for everyone who invests himself in it for initiation, instruction and inspiration. Kindred souls come from all over the world, and so one is bathed in the glory of Sai which each one brings in his heart, treasured with loving care. Each person has a golden book of experiences of Baba's Grace written in tears of gratitude. The scholars whom Baba encourages to delve into the intricacies of philosophical speculation so that they may ultimately gain the philosopher's stone which transmutes distinctions into the One Divine, speak in his Presence of the unfathomable mystery, and later Baba unravels the same and renders it understandable by His sweet simple comments. As the supreme educator of the Age, He leads us through song, drama and discourse, through glance, gesture of gift, through word, wit or rebuke, into the path which leads through Love unto Light. The Yajna which is performed for seven of the nine days is a lesson in spiritual science, for we experience, while it is witnessed, the whole gamut of bliss. The bliss of contemplating the formless, attributeless, cosmic principle described in the Upanishads; the thrill of conceiving and adoring the solar orb as the source of Light and Life; the joy of installing in our hearts the author of this amazing adventure of Creation (Brahma) - Continuance (Vishnu) - Destruction (Shiva) as emerging from the formless into form, or as merging from the form into the formless (as the Linga or Spheroid) symbol which is worshipped as part of the Yajna; the exhilaration one is filled with when the Sakthi is consecrated, praised and propitiated through an image into which she is invited ritually to contain herself, the recalling to memory of the sweetness of Vedic hymns, and the ecstasy of epic poetry - Baba uses every medium of expression to convey to us the message of self-control to silence the clamour of the senses and the mind. Every Dasara He writes a play in which the children of the Vedasastra Patsala, whom He trains for the purpose, pronounce spiritual truths. This Dasara, the play was on Dhruva, [*Dhruva's story*] the princely lad of five who went into forest to win by austerity the Grace of God, so that he might be restored to the love of his father. But, as the austerities cleansed his mind and sublimated his nature, the wounded pride was healed and he prayed for the boon of mergence with God. "People come to Me to get a chronic illness cured, but when they get to know Me more, they clamour for more substantial boons which I am ready to grant," says Narayana in the play, an echo of the experience of most of the pilgrims to Baba's presence! "Ponder over the ameliorate and curative advice I have given you out of the fullness of My Love; try to cleanse your minds through repentance of wrongs committed or contemplated; resolve with unshakable firmness to shape your lives anew, rid it of deep-rooted deleterious habits of speech, thought and action, and lead it in conformity with the divine plan, by which each will blossom into the fully Divine."